My actual design wall looks the same today as it did last week. I did make some progress cutting pieces for the sashing and borders of the two BOM WIPs. 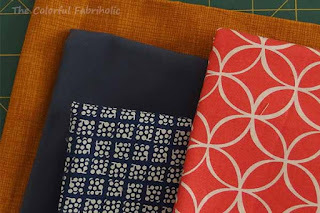 I'm participating in the Fabri-Quilt New Block Blog Hop. 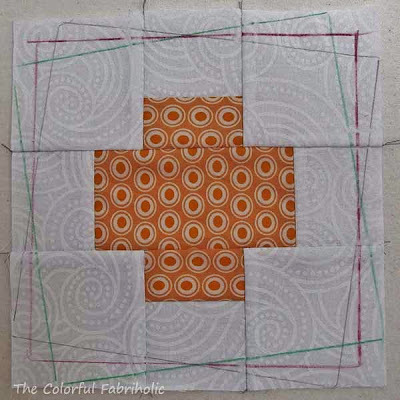 My day to post my block and tutorial is Wednesday, Sept. 2, so come back then and see my block. 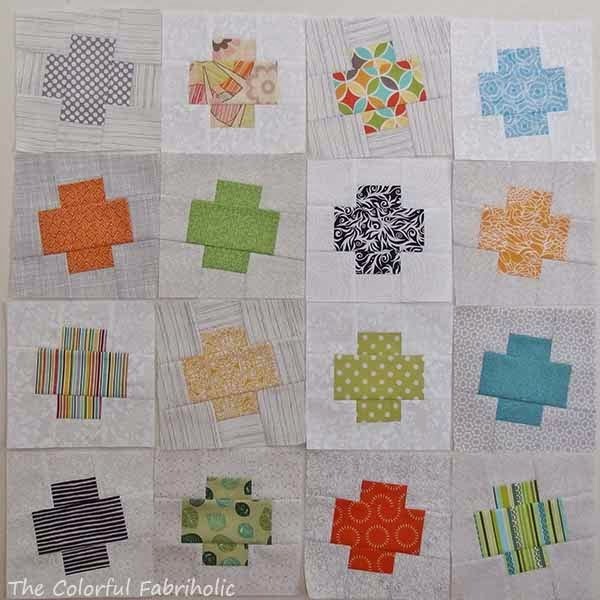 The blog hop starts today over at Quilting Jetgirl, so go check it out. There's a giveaway, too. 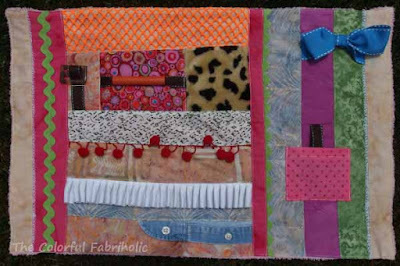 My Fabri-Quilt block tutorial is mostly written, just needs a few tweaks, so I'll work on that and have it ready to post Wednesday. 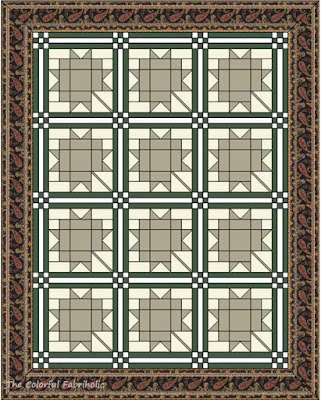 As an added bonus, I've used by block in some EQ quilt designs. I'll post a tutorial for my favorite design on Friday, so come back for that. It's pretty cool, very versatile depending on the coloration. Spring, Summer, Christmas, Quilt of Valor, or whatever you want depending on the colors you choose. Writing that tutorial will keep me busy this week. 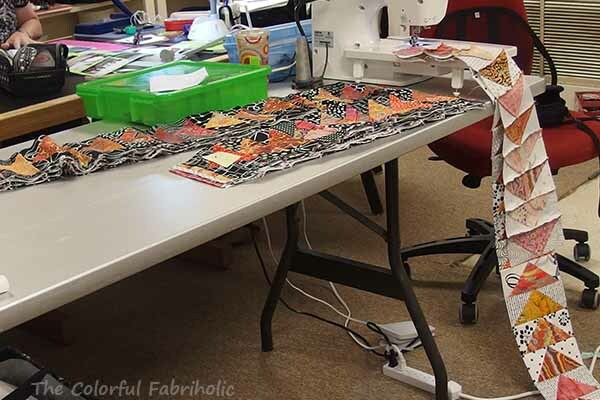 The other deadline item I need to have written by Friday is the supply list & pre-cutting instructions for the workshop I'm teaching at Sew Me St. Louis, an STLMQG event being held in October. 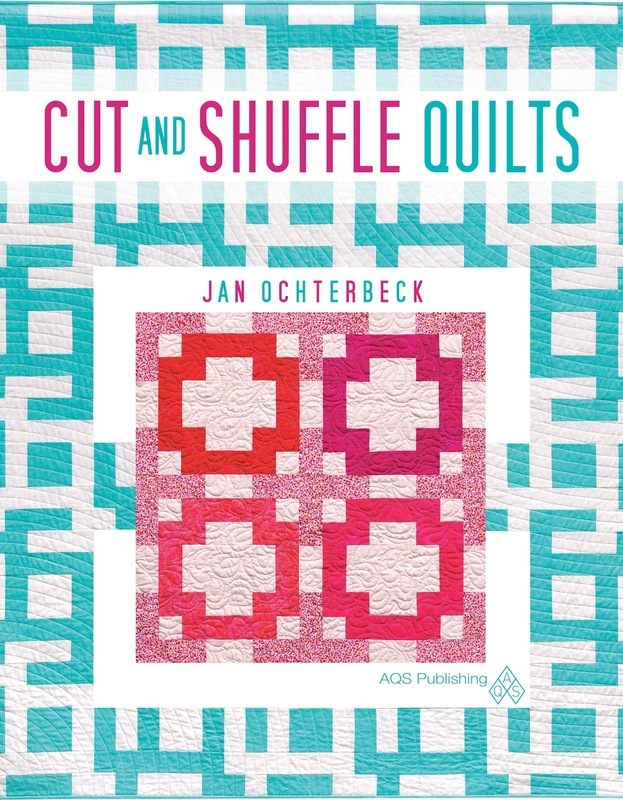 I'm teaching blocks and my fun and easy method for constructing them from my soon-to-be published book, Cut and Shuffle Quilts. 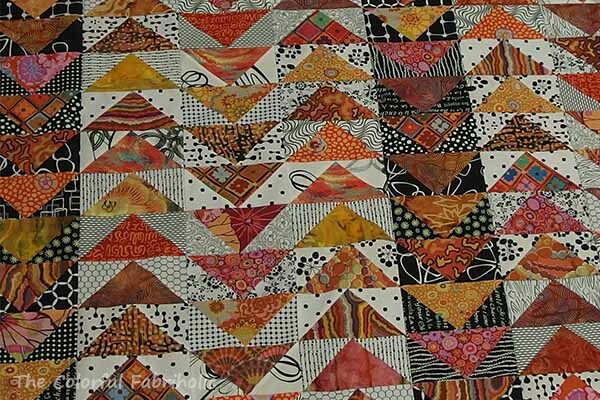 So even though my design wall is electronic this week, I'm linking up with Judy at Patchwork Times. Check out everyone else's real design walls over there. Net Change this month: 5-7/8 yards out Yay, moving in the right direction! I'm moving closer to my goal of breaking even for the year. Mostly I've bought fabric only for specific needs, but the goodies from the free table at guild added up this month. Here are my additions. The first two photos are the guild freebies and a LQS FQ freebie. The second two photos are borders & sashing for current WIPS. 3. Layer, baste, quilt, & bind one quilt (one of the above, or last year's bee project). DONE, Basketball donation quilt. 4. 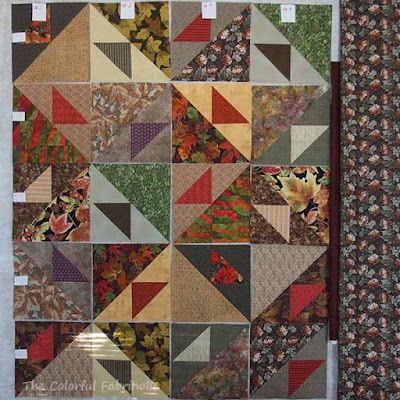 Decide on layout for QF blocks and organize as needed for piecing in September. May need add'l fabric. DONE. 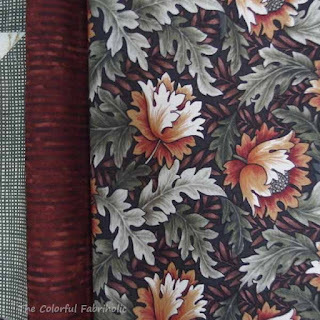 Purchased add'l fabric for borders & sashing. Cut sashing for assembly in Sept.
5. Keep up with bee blocks & resolve the problem from May. DONE and problem resolved. 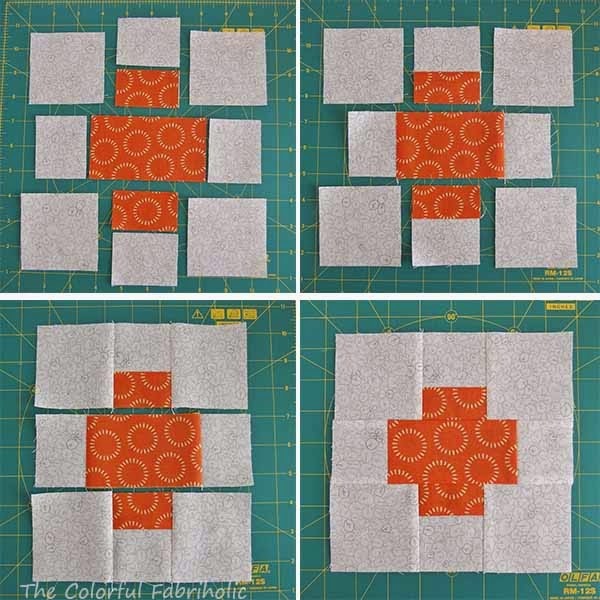 Other: Made block and wrote block tutorial for Fabri-Quilt Block Design Blog Hop. Posting Tuesday Sept. 2. 1. 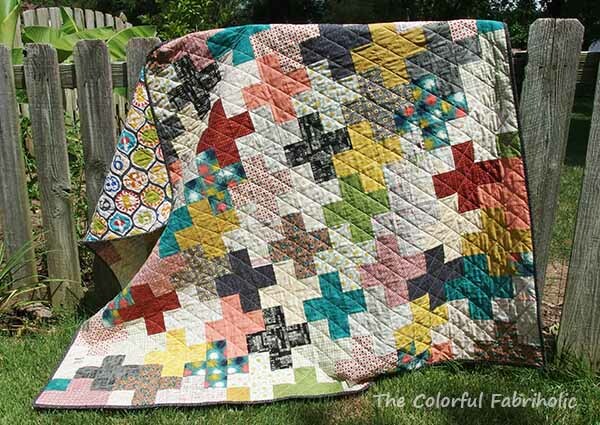 Write tutorial for piecing a quilt top using my Fabri-Quilt block. Post on 9/4. 2. Start prepping demo materials for teaching Cut & Shuffle workshop in October. Supply list due 9/4. 3. Piece QF Alt. Block top including borders to a finished flimsy. 4. Piece sashing for QF main blocks and if time permits, assemble top w/ borders to a finished flimsy. So what's on your plate for next month? I'm linking up with Judy at Patchwork Times; check out the other stash reports over there. 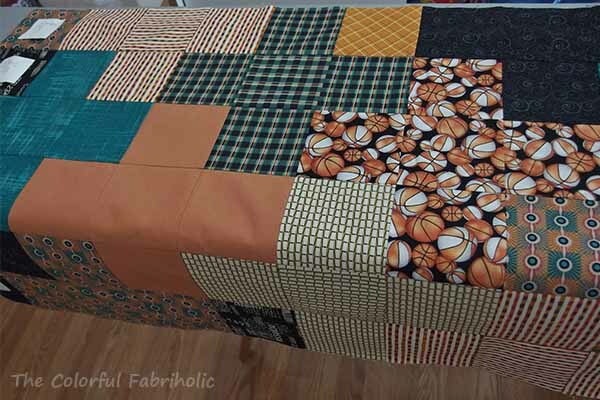 In last Sunday's stash report I mentioned that I had finished the basketball donation quilt. I was able to get some outdoor photos this week. STLMQG is having a donation drive for kids' quilts, due in November. I'm not sure if it's officially Project Linus or a similar charity, but same purpose. There's always a need for quilts for boys that don't look too babyish. Basketballs and masculine prints. This should do for an 8-12 year old boy, I think. It's 44" by 56". The backing is the same solid brick orange as in some of the pluses on the front. You can see a glimpse of it in the top photo. It's the last of a 200 thread count sheet I bought pre-2000. With the simple SID quilting, the back looks like a puffer jacket. The binding is the last of a versatile stripe I've had in my stash for several years. I've used it so many times I'm tired of it; it's good to finally use it up. This is #26 on my personal list of donation quilts for kids. 74 more to go in my lifetime! Guess I'd better get busy - I'm not getting any younger. 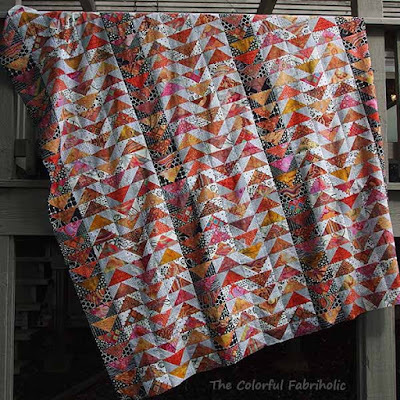 Linking up with Friday Finish at Crazy Mom Quilts and Whoop-Whoop Friday at Confessions of a Fabric Addict. The QF First Saturday BOM series that ended in July generated 12 main blocks and 24 alternate blocks. Their suggested layout results in a ginormous quilt, 105". I have a different plan. 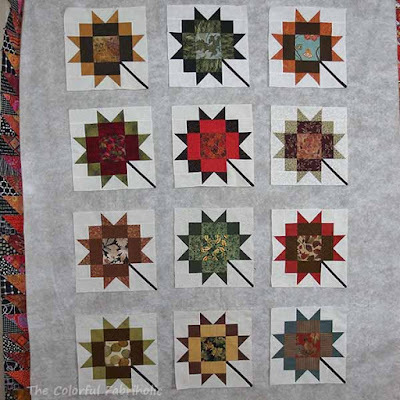 I'll use the main block, Maple Leaf Star, with sashing & borders for one sofa-size quilt. I'll use the alternate blocks, giant Shaded Four Patch, for another. These will end up as gifts. So, 2 quilts from one year's worth of BOMs. I shopped for border fabric earlier this week. Yes, my stash report will have to take a hit, but sometimes you have to buy fabric to finish UFOs, and these purchases will be used right away. First up, the alternate blocks* and their borders. 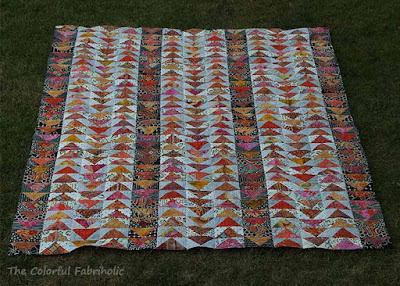 I'm using 20 of the blocks and the finished quilt will be 63" x 75". Here are the blocks on the wall with the border fabrics. 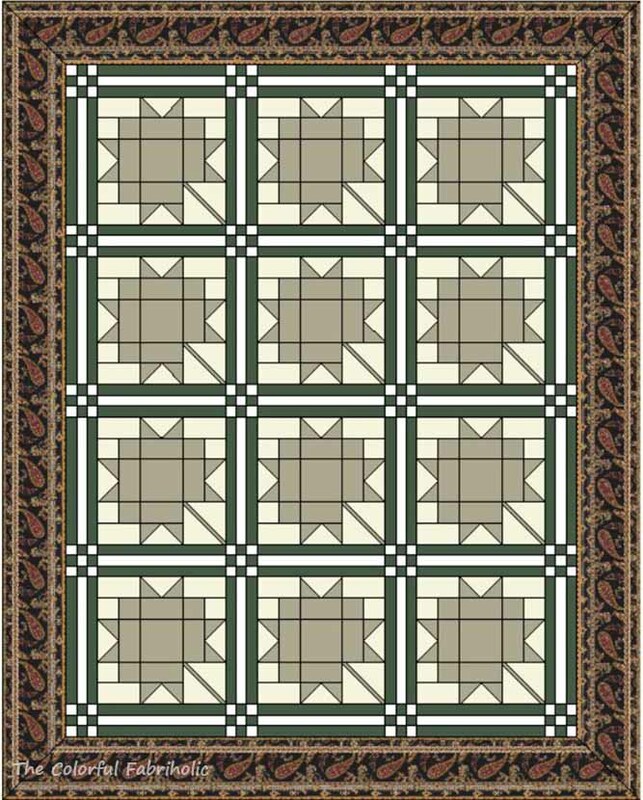 The outer border print is used in two of the blocks. 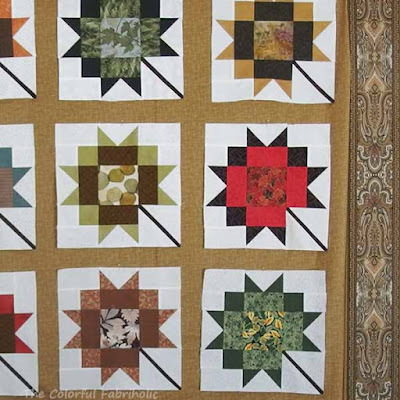 Here are the blocks with the sashing & border fabrics on the wall. Keep in mind the sashing will be pieced so it won't look as heavy as this solid gold. With all that white going on in the blocks, I knew I needed a border print with some light tones in it, or the borders would look way too heavy. I think I found the perfect option. And a close-up of the sashing & border fabrics. I see mitered corners in my future. The color is a bit flat in this photo; it's actually much more golden, less beige. Next up, cutting, prepping, and organizing these to work on in September. *For local friends who might recognize these QF blocks, you'll notice that I left some out and added a couple using my own fabrics. The flying geese top is still on the design wall because it's pressed and I don't want it to get wrinkled. So to use the wall, I pinned up a flannel-backed tablecloth over the FG top. Voila, the layered-look design wall. DH noticed and commented that I need a bigger studio. So, what's on the wall? The blocks laid out are the alternate block from the last QF First Saturday BOM. I swapped out a couple of blocks I didn't like and added a pair made from stash. I can see that I need to move the blocks around a bit for better color placement. The plan is to add a dark narrow stop border and a 6" wide leafy print border to make a sofa quilt. I'm thinking of changing to a 4 x 5 layout instead of 4 x 6. 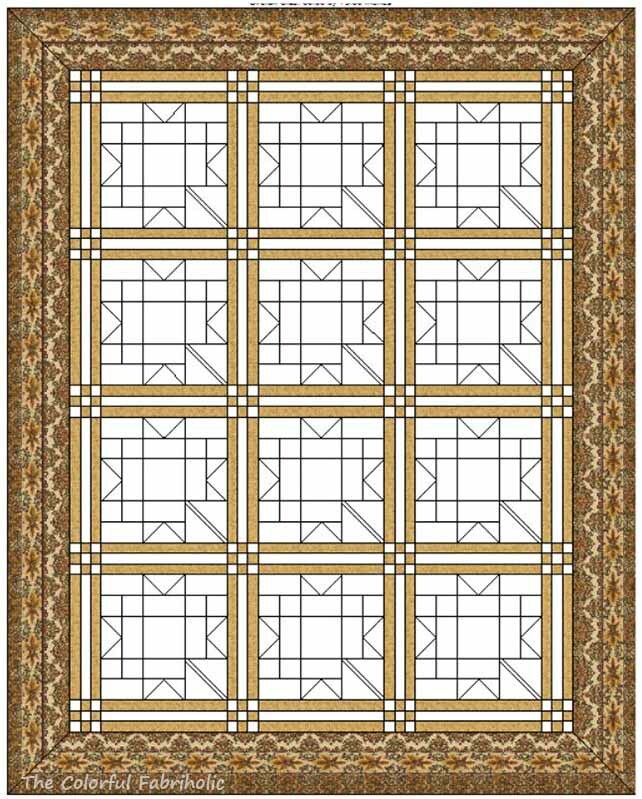 With a 4 x 5 layout the finished dimensions will be 63" x 75" which is a good size for a sofa quilt. It may become a Christmas present. If I find a not-quite-camo woodsy or leafy print for the border, it'll be perfect. I'll need to purchase inner and outer border fabric for this one. I need to get ivory tone-on tone and something dark for the sashing for this one. 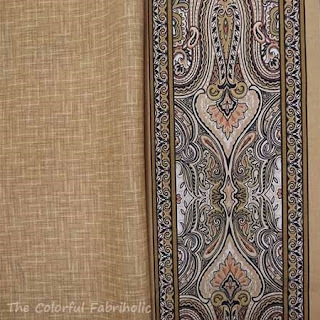 I have a border print that might work for the outer border, or I may have to purchase additional fabric for the border. My plan is to get these planned, purchased, and cut so I can assemble the tops in September. Planned fabric acquisitions in order to move projects from UFO status to finished are acceptable (even though my stash report takes a hit), right? Linking up with Judy at Patchwork Times for Design Wall Monday. 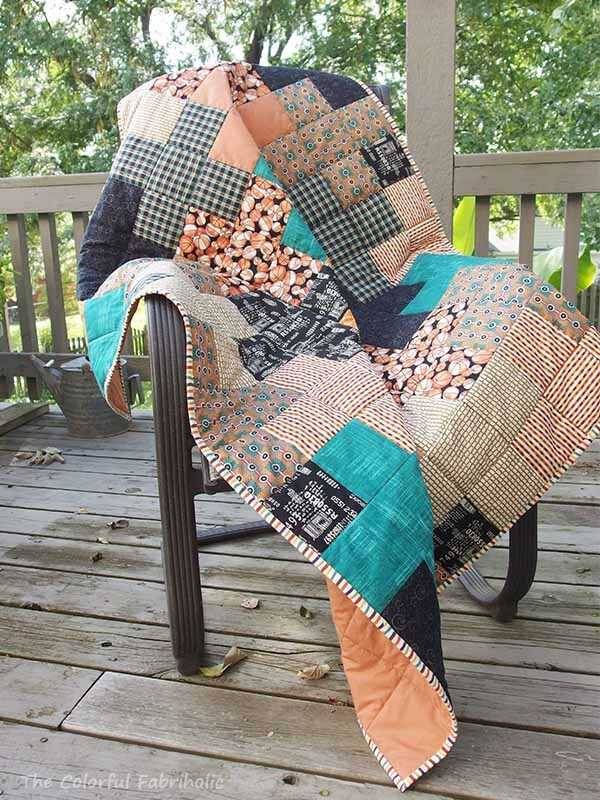 Check out the other quilty inspiration over there. Nothing in again this week, yay! And, I finished the basketball donation quilt yesterday so I get to count it out. 2-5/8 yards for the top, 1-7/8 yards for the back, and 1/2 yard for the binding. OUT this week, 5 yards. Still moving in the right direction! Totals at the end of the month. This week or next I may have some acquisitions, but all planned for specific purposes. 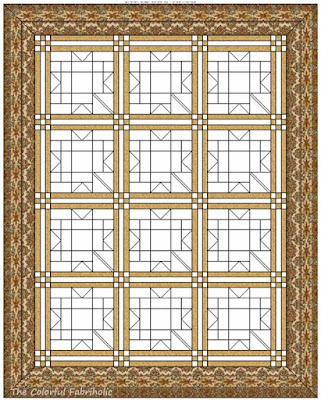 I'm planning to use my blocks from the last QF First Saturday series for two sofa quilts for potential Christmas gifts. I'll need sashing and borders for one, and borders/setting triangles for the other. 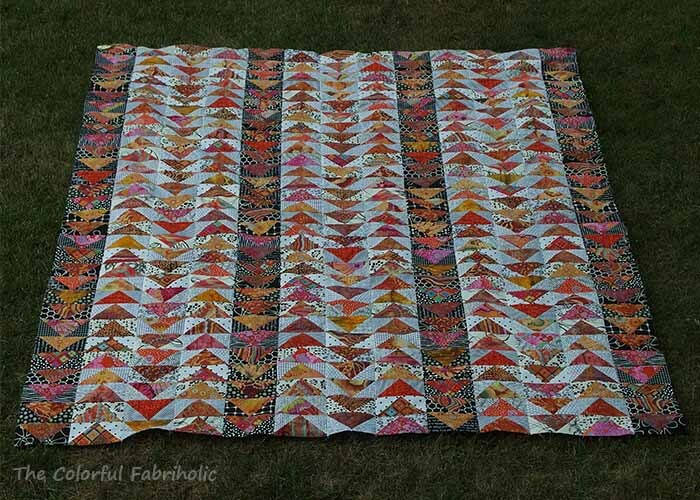 Also, I'll need to purchase backing for my flying geese quilt. With all those seams and the weight of the top, I want a no-seam wide backing. So, some yardage will be coming in, but for specific usage, not merely stash enhancement. 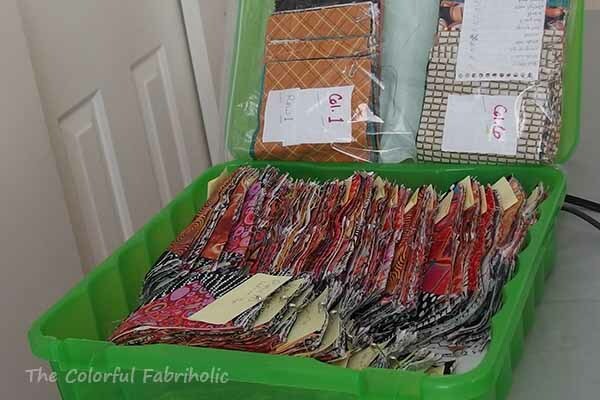 Linking up with Judy at Patchwork Times; check out everyone's stash management progress over there. Awhile back I was whining lamenting to my friend Marie about pin basting. Because of the arthritis, etc. in my hands, I can't manage safety pins. I've been using straight pins. They're okay, but they sometimes pop out before I'm ready, and they snag on other parts of the quilt. They often scratch my left arm and neck when I have a quilt draped over my shoulder for machine quilting. I told Marie about something I had seen but couldn't find, and didn't I know the name of them. 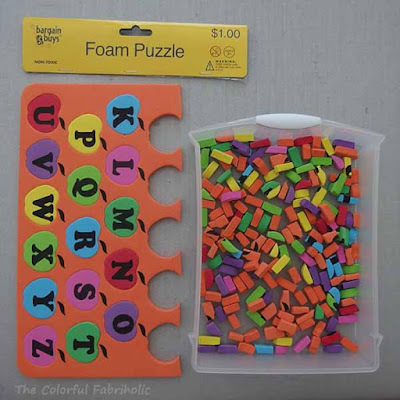 They were little caps to put over the points of the pins, about the size of pencil erasers. If I could put caps over my pins, they would solve my pin-basting problems. She suggested craft foam, but I found that it's too thin. Marie recently gave me something to solve the problem: a foam puzzle (bargain!) that she thought was thick enough to work, and soft enough foam that it could be cut and would slide over the pin points easily. Yes! The thickness is perfect, a full 1/4", and as you can see, I've already started cutting it into caps for my pins. These little caps are working great! 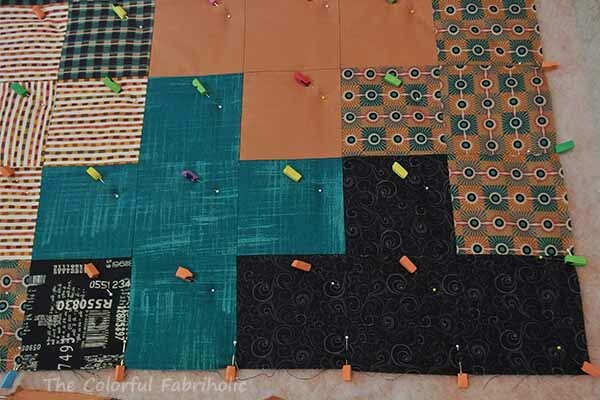 It didn't take much time at all to slide them onto the pins as I was pinning the quilt sandwich together. So far they're working well - no scratches or snags! I'm almost halfway done with SID, then I'll take out the pins and quilt a diagonal grid across the patches. This is another Plus quilt, a donation for STLMQG's quilts for kids drive in November. 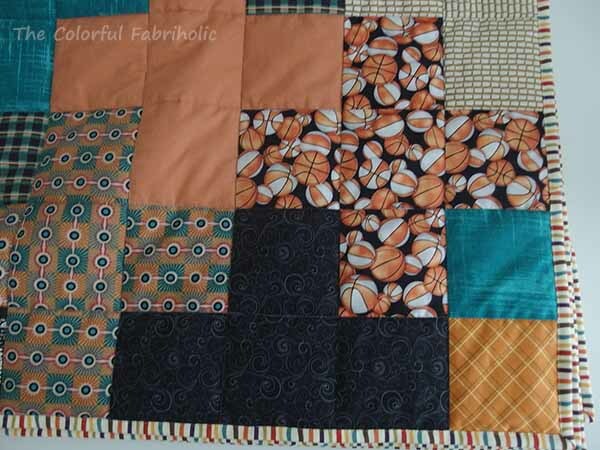 I thought the basketball print and the masculine colors would make it suitable for an older boy. Anyway, Thank you Marie for giving me the solution to my pin basting woes! 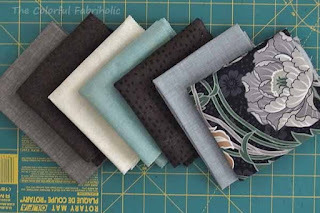 This is definitely whoop-worthy, so I'm linking up with Whoop Whoop Friday over at Confessions of a Fabric Addict. 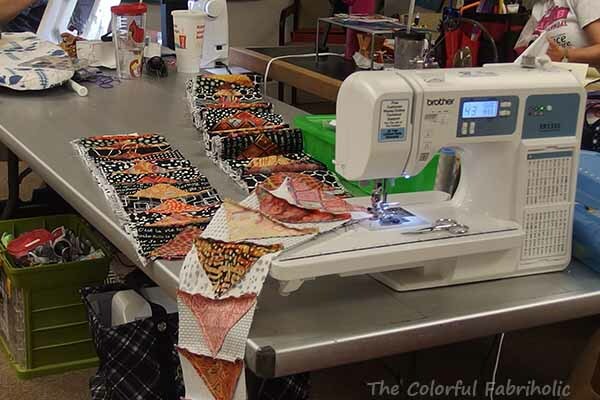 Back in July when I was prepping for camp, I cut, laid out, and organized this project to take with me, in case I finished the flying geese top and needed something else to work on. 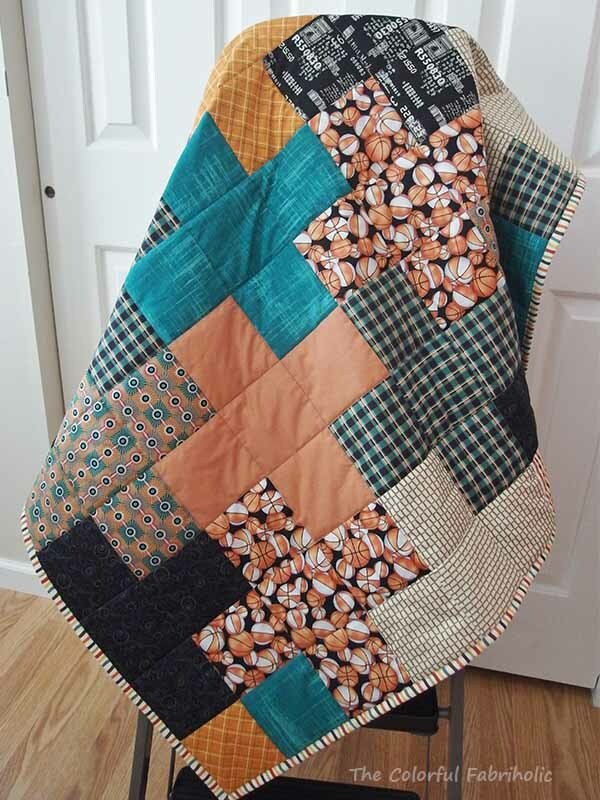 This is a donation quilt suitable for an older boy, in masculine colors and patterns including a basketball print. After I finished the FG flimsy last week, I pulled this out to work on over the weekend. Easy no-brainer sewing, since it was already organized. I was able to get all the rows sewn, and some of them joined together. Here they are laid out on my ironing board. The reason it's not on the design wall is because the design wall is occupied. The FG flimsy is all pressed and I don't want to fold it up and get it all wrinkled, so I'll leave it on the wall until I'm ready to layer and baste it. because I really, really like this project! Nothing in this week and 13 yards out for my flying geese flimsy. Totals at the end of the month. At least I'm getting closer to breaking even. I didn't think I would get this finished this week, but I managed to get the last seams in this afternoon. So I dashed outside right away and snapped a couple of pics. 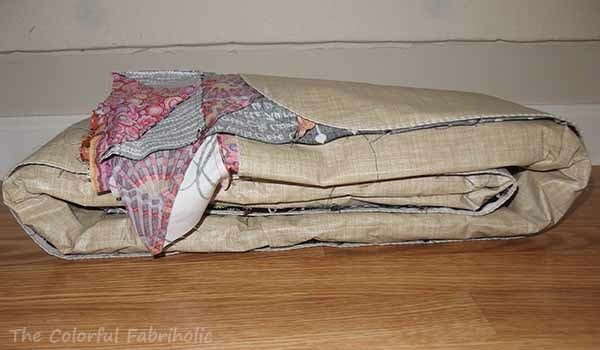 So many seams - this flimsy is heavy! 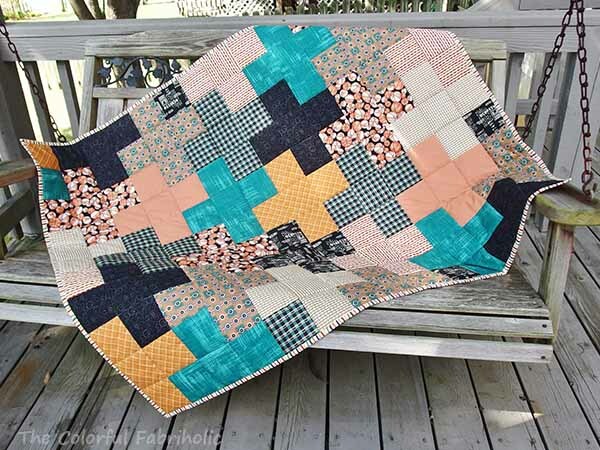 Link ups: Whoop Whoop Friday at Confessions of a Fabric Addict and Friday Finish at Crazy Mom Quilts. My flying geese project is laid out on a flannel-backed table cloth in the photo above. To bring it home, I simply rolled it up. I haven't had a chance to get back to it, but I'm hoping to have time to work on it this week. I do have other priorities on my to-do list, though. I have to get the label and the hanging sleeve on Gramercy before Tuesday next week. I'll be entering Gramercy & Friends and Broken Chevron into a show this fall. Since I'll be away on the day the quilts have to be turned in, someone else will take them for me, and I have to give them to her Tuesday night. I signed up for the Fabri-Quilt Block Design Blog Hop (there's a mouthful!). 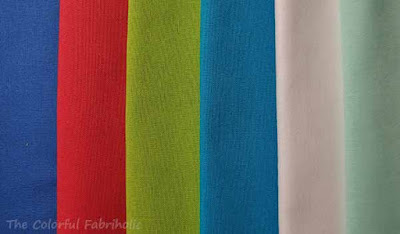 These are the fabrics from Fabri-Quilt that each designer is using. My date to post my block and tutorial is September 2. I need to get busy and design something. I also have some administrative stuff and some outside appointments going on this week, so I don't know how much progress I'll make in the sewing room. What do you have on your plate this week? 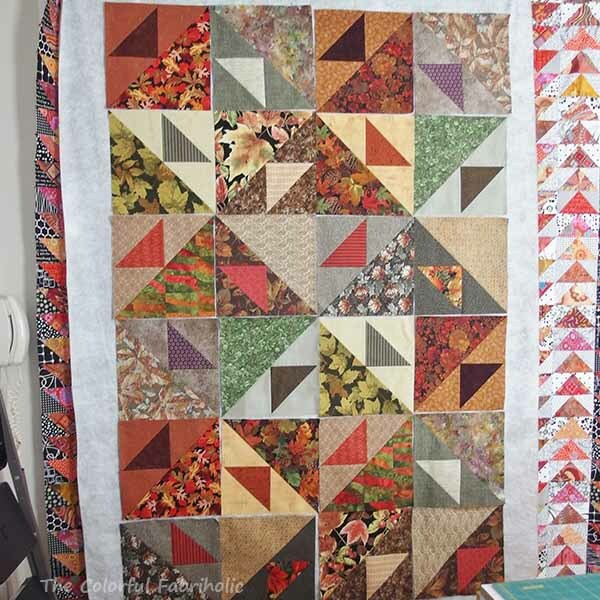 Linking up with Judy at Patchwork Times for design wall inspiration. Stash Report 8/9/15: It's all good, right? I really wasn't planning on adding much to my stash this week. Just a FQ from my LQS's promotion to win 20% discount for a year. That was my plan. That changed. All this came home with me Saturday: FQs and 10" squares (2 of each dark, white, and green). You see, someone at STLMQG was seriously destashing and donated a box full of good stuff to the free table at guild. Everything you see above came from that except the large floral print. Score! The large floral is my FQ from the shop's promotion. Turns out, it works perfectly with some of the fabrics from the guild. All this was free. Free is good, right? So it's OK if the stash numbers take a hit, since the wallet didn't. Totals at the end of the month. I'll have to get busy and finish something to offset these acquisitions. I'm still behind for the year in my goal to break even. Modern and traditional quilters unite with these easy to make quilts. 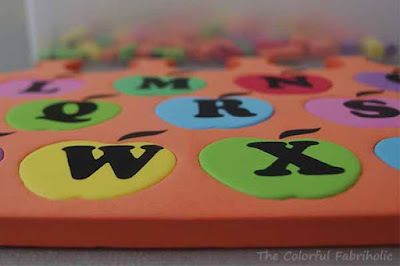 Complete instructions are included starting from a simple square called the “Block Mama” which is then cut, shuffled, and reassembled to create four unique blocks. 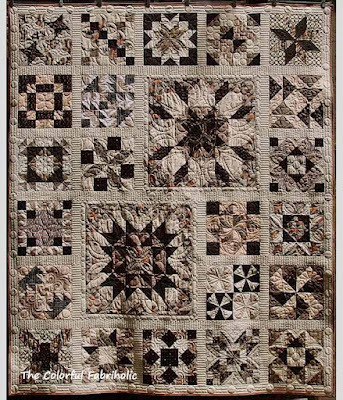 The blocks are featured in six different quilts. For added creative inspiration, alternate fabric and colorway suggestions are given for each of these versatile quilts. My book has been a very long time coming, but now it really is coming soon. 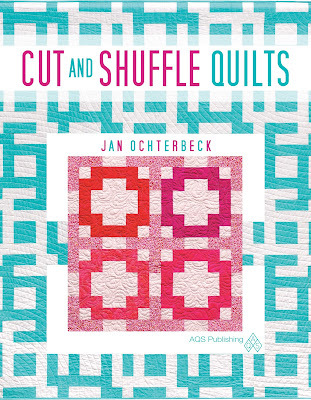 AQS has it listed in their September/October catalog. Amazon has it listed with an August 18 availability date, but that's subject to change. My editor is anticipating a final proof from the printer and as soon as she approves it, my book can go to print. It may not be ready by August 18, but as soon as I hear anything I'll post an update. I'm participating in "Throwback Thursday" over at Quarter Inch From the Edge. It's a chance to show off something I created before my blogging days. Loop in Motion was created as part of a CSQ guild challenge to celebrate the centennial anniversary of University City, Missouri, in 2006. U-City has a hip, vibrant neighborhood called the Loop that has an annual festival called Loop in Motion. Yes, that's all one continuous undulating loop of color! 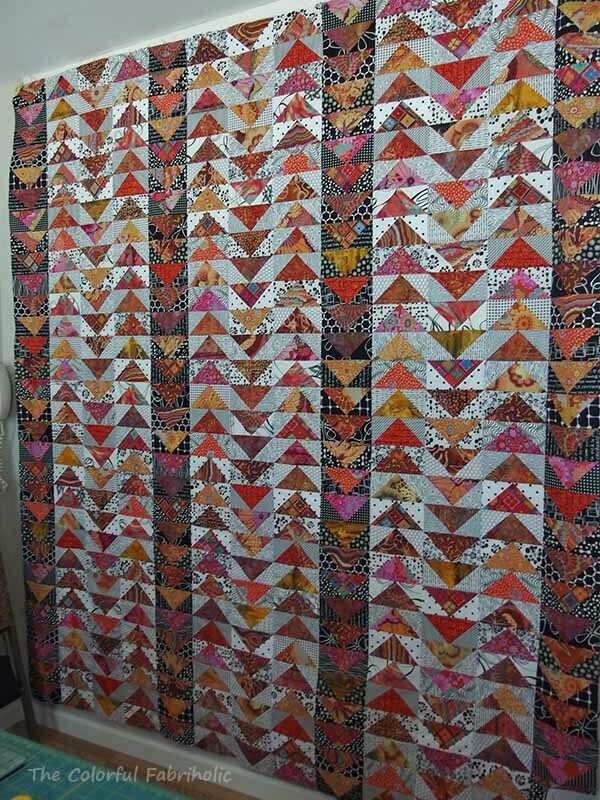 This quilt is all pieced, not appliqued. 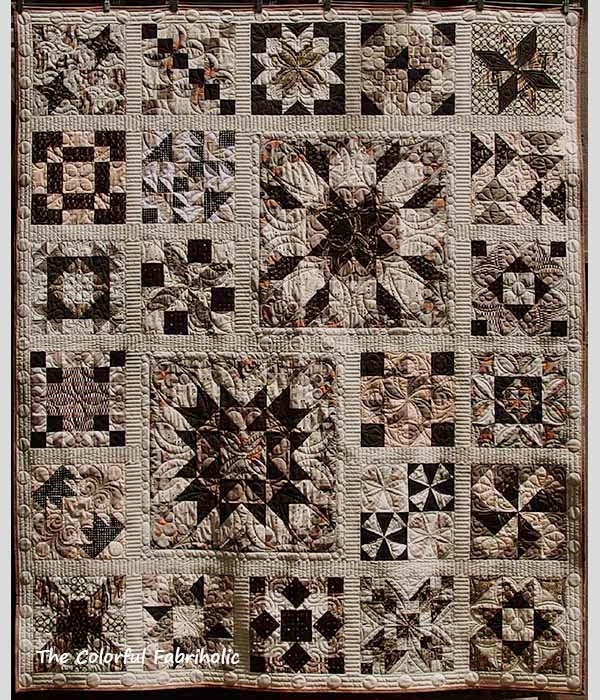 It's made of 6" blocks, each with one or two quarter-circle arcs, all hand pieced by members of CSQ Piecing Group. 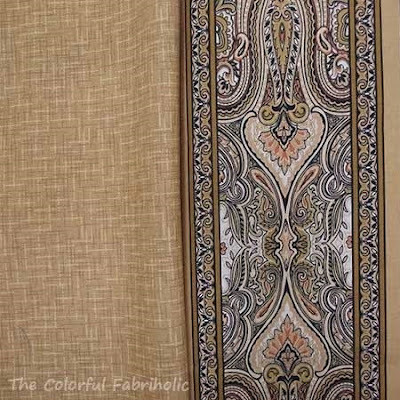 The colorful fabric is all one commercial batik print, fussy cut and laid out so the colors flow into one another. 60" square, machine quilted by me. What did you make before your blogging days? 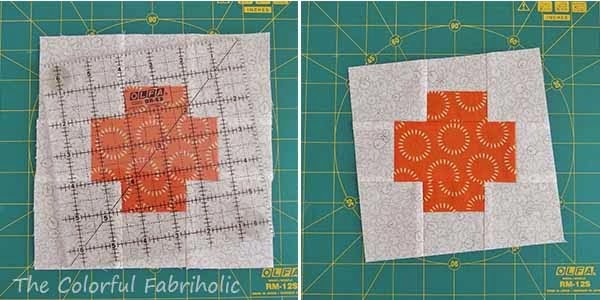 This is a tutorial for bee blocks for members of Sew Bee It as well as for anyone else who is interested. Sew Bee It members, please see the notes for you below. Thank you for making blocks for me! Please link back to this post if you pin this tutorial. Block size 6” finished; will be oversized at first. · Plus Motif: Use bright or dark prints. o As you can see in the photo above, prints that read more one-color-ish than multi are more effective. o Medium, bright, or dark colors work better; light colors don’t contrast enough with the background. Note, if cutting from a 5” charm, cut the charm in half (two 2-1/2" strips). Trim one of these pieces to 4-1/2" long. Then from the other piece cut a strip 1-1/2" wide running the length of the charm (5") and sub-cut it into two 2-1/2" pieces. This will keep your print going all in the same direction, like my striped blocks above. 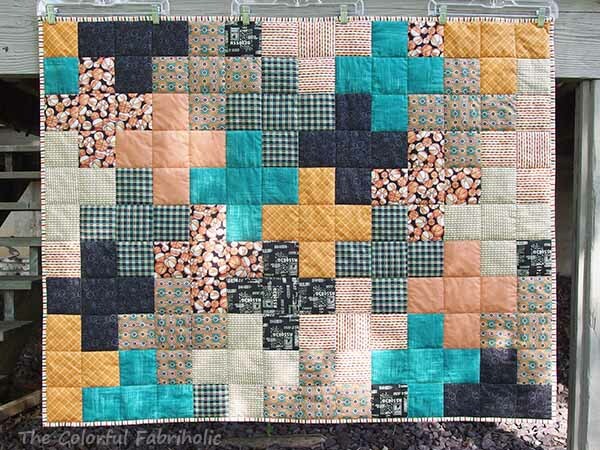 Block Assembly: All seams ¼”. · Sew a 2" by 2-1/2" background piece to each small colored piece and to each end of the larger colored piece. 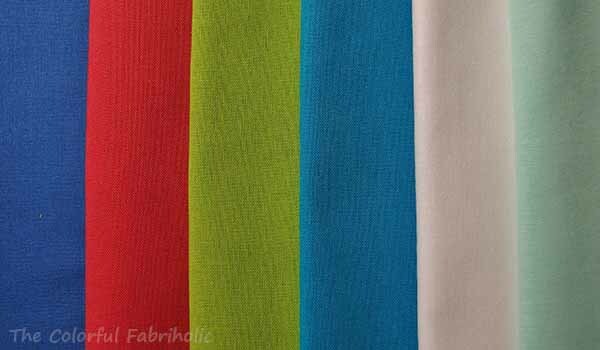 Press seam allowances toward the color. 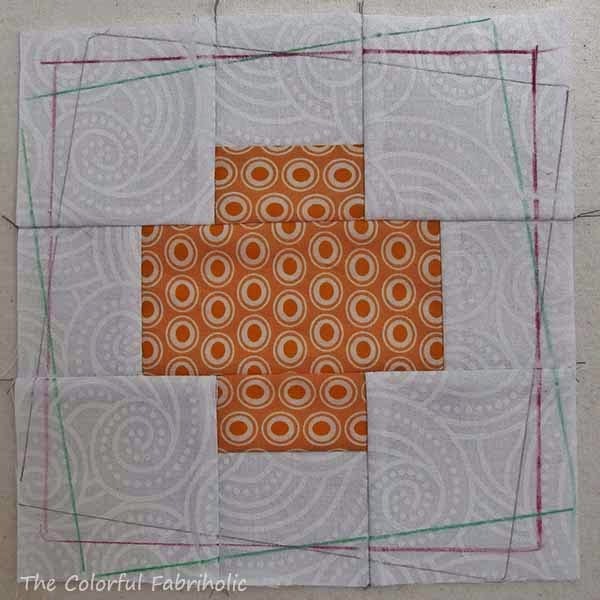 Use any 6-1/2" square ruler and place it any way you like on the block. Trim around all four sides to yield a 6-1/2" unfinished block. FYI, when trimming, if the ruler tilts to the left as shown below, the plus will dance to the right. If the ruler tilts to the right, the plus will dance to the left. Trimming the blocks to 6-1/2"
1. Please make two blocks, more if you like. These little guys are addictive, and since they’re little, it will take a lot of them for a quilt top! Background fabric is provided for one block. 2. * Please DO NOT trim down your blocks, just return them to me oversized. I would like to plan the placement of colors and then determine which direction the plus motifs dance. Thank you! I had so much fun at quilt camp. Thank, you, Chrissy, for inviting me! 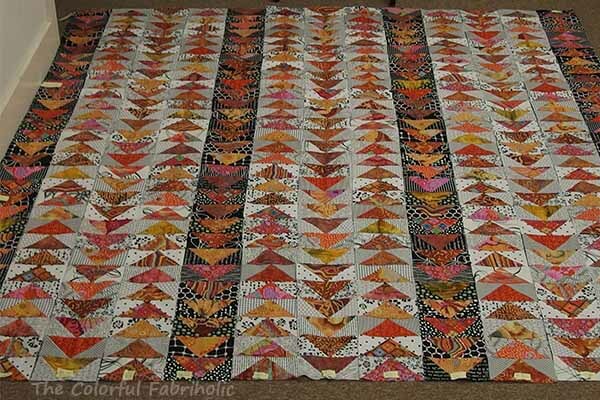 You may remember that I had packed up my KBFG project (Kaffe & Batik Flying Geese) to work on at camp. 390 flying geese units, previously laid out on the design wall, all organized and stacked up for assembly at camp. I got them sewn into long strips: 13 strips of 30 geese each. This will finish at 78" by 90" before quilting. 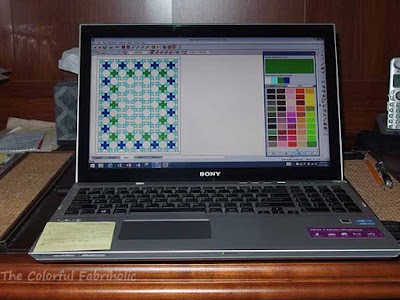 My workstation at "quilt camp"
It took hours and hours. It became boring after awhile, but camp is the perfect setting to work on something like this. I'm here to sew, which puts me in Energizer Bunny mode: just keep going and going and sewing. Eventually all the strips were completed and laid out on the floor in the hall. Once last chance to check print placement to make sure the same print wasn't too close to itself. Whew, no ripping and moving geese needed. Ah, very satisfying progress! 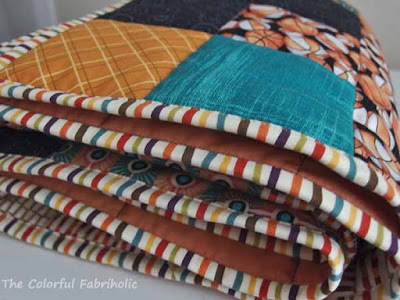 I just love all these fabrics together. Such a riot of color and pattern, within a somewhat controlled palette. By the time it was time to pack up to leave, I had seven of the strips joined together. That's a lot of seams to match and points to be careful of! Here they are laid out on a flannel-backed tablecloth, which I could roll up to take home. Five more long seams to finish at home, and I'll have a completed flimsy. I hope to get back to them this week, but I have a deadline project due Saturday that I just found out about at camp, so I don't know whether I'll get this KBFG flimsy finished this week or not. About that deadline project: Due to some scheduling issues and special events, STLMQG isn't going to have regular meetings in September and October. Therefore my bee won't be able to meet those months. Since several of us in the bee including the leader were at retreat, we decided that the people who were to hand out in September (Chrissy) and October (me) should hand out in August, this Saturday, and everyone will have until November to get their blocks done. Some members have prior months to catch up on, too, so November will be a big reunion & block reveal month. So, I have to get my project together to hand out Saturday. Fortunately I have a plan and it's partially started. I just have to write and post a tutorial. We'll be making Dancing Plus blocks. I'll post the tutorial on this blog later this week so I can include a link to it in the instructions. So that's what's on my plate for this week. What are you working on? Check out the inspiring projects at Patchwork Times. IN this month: 4.875 yards, all except 1/4 yard acquired with specific purposes in mind, and already used. Moving in the right direction this month but still a ways to go to break even for the year. Some WIPs could make it to the flimsy stage in August, and I'd like to get at least one WIP or UFO quilted and bound, so maybe I'll be able to count out more in August. We'll see. 1. 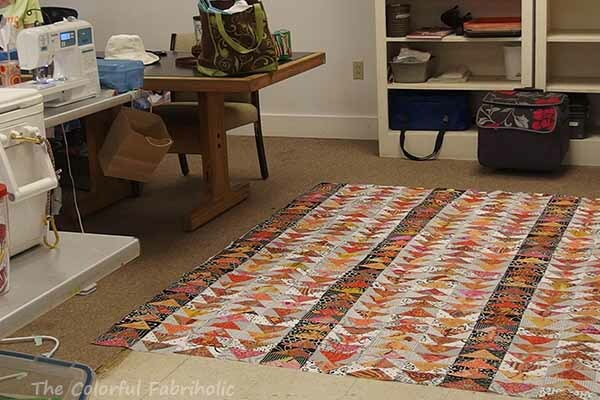 Organize Flying Geese project to work on at quilt camp. DONE: organized and in work. 6. Keep up with bee blocks, including resolving the problem from May. No Sew Bee It meeting this month so no new block and May problem not resolved. Other bee block & BOM done. Other: Cut & organized a simple donation quilt to piece at camp if I get the flying geese project done. 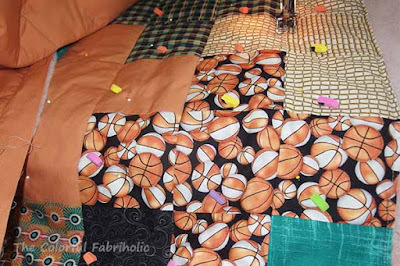 Uses basketball fabric so it should be good for a teen boy. All in all, July was a very good month for both the stash report and the goals. Hopefully August will be equally productive! 4. Decide on layout for QF BOM blocks and organize as needed for piecing in September. May need add'l fabric. 5. Keep up with bee blocks & resolve the problem from May. So what do you have planned for August? Linking up with Judy at Patchwork Times. Check out everyone else's stash management progress over there.